"I used a similar recipe to this as a base for my first time cooking salmon. I added some extras to the honey-mustard sauce and thought of making the white wine sauce while the salmon was cooking. My wife, who hates fish, not only loved it, but asked me to make it again the next day. Needless to say, we've found a way to bring fish into our home. 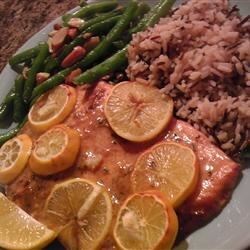 Green beans and wild rice is a great side for this salmon. Serve with lemon wedges." Place salmon fillets in an oven-safe dish. Sprinkle with salt and pepper. Melt 2 tablespoons butter in a microwave-safe bowl. Whisk in honey mustard, vegetable oil, Worcestershire sauce, minced garlic, balsamic vinegar, parsley, garlic powder, and liquid smoke. Spoon enough sauce onto the salmon to cover it well; brush sauce around with a basting brush. Top fish with 1/2 the lemon slices. Broil in the preheated oven until fish flakes easily with a fork, about 10 minutes. Melt remaining butter in a small saucepan. Add the remaining salmon glaze and whisk to combine. Add white wine; whisk and reduce by 1/4. Stir in cornstarch; stir until no lumps remain and sauce begins to thicken. Plate the salmon and drizzle the white wine sauce on top.